I work with lots of lovely ladies in my business, women with all sorts of fantastic talent and creativity. But if there’s one group of ladies that I’ve seen grow hugely in both capability and reputation over the last few years it’s Virtual Assistants. It’s official; VA’s are the new business black. Once viewed as more of a secretary or online admin Assistant, today’s VA’s are an entrepreneurial force to be reckoned with, providing a wide variety of essential business support, from book keeping and diary management to content research, blogging and social media management. It’s this last role that has bought most VA’s to my digital door. Social Media Management is a tough gig that requires lots of research, a nimble ability to stay ahead (or at least keep up with) the latest trends and algorithm updates, killer organization skills (scheduling across multiple platforms is a job not to be underestimated) and the creative ability to design attention grabbing graphics such as cover images, promotional images and memes. And it doesn’t stop there; in this day and age, visual content is almost 100% of your business – regardless of what type of business you have. So it makes total sense for Virtual Assistants to take advantage of this tool to up level their client offerings. Without a doubt Canva is my recommended, go-to tool for easy online graphic design. It’s an amazing design platform that enables pretty much anyone with a keen eye and a bit of tech savvy to be a graphic designer. Hurray! But, like any online tool, the more you know the more you can do, so in this post I’m revealing all the fab reasons why Canva is an essential tool for savvy, social Virtual Assistants. No need to download disc clogging software to your computer, no need to stay on top of constant updates, Canva is a totally online tool that you can access from any PC, MAC or tablet. As long as you’re online you can get on! Need to design awesome graphics on the go? Canva also comes as an app for iPhone, iPad and android. There’s a little less choice than the full online version, but you’ll find all the graphics you’ve already created under the ‘Your Designs’ tab. Great if you’re out and about or at a client’s office and need to download an image you made earlier. 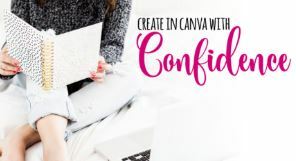 If you’re just starting out with social media management or have been asked to create some graphics for a client for the first time then the free version of Canva is a great place to start. There are over 8,000 handy templates to choose from – one for each social media platform – and each template has a variety of free designs available too! There’s also grid designs, patterns, filters (oh yes Insta fans) shapes and lots of fab fonts to choose from. You can even upload your own images to your media library (you get 1GB of space) which makes it easy to add client logos to your graphics. The user interface is pretty easy to work out, you get two folders to organise your work and you design your images using drag and drop manoeuvres – super simple! The downsides? The free version doesn’t offer much in the way of stock images, although at just $1 an image it’s still great value and you can’t upload your own fonts, which means if your clients fonts aren’t available you’re kinda scuppered from a brand perspective. There’s also no way to save your clients brand colours, which means each time you create a new design in a new template you’ll have to type in the Hex codes. And the paid version of Canva is ever better! If you’re taking your role as social media manager seriously and definitely if you have multiple clients then the paid version of Canva is a great investment for virtual assistants. And at just $9.95 a month if you pay yearly or $12.95 each month your costs will more than likely be covered by the fees you charge clients for your work. It’s a no brainer really! With the paid version you can manage all the graphics for multiple clients in one place, upload your clients brand fonts, add and save specific brand colours (no more typing in Hex codes all the time) save templates and choose from thousands of stock images and graphics, over 300,000 of them now free. You also get unlimited space for images and unlimited folders to organise your work, phew! One of my favourite tools in the paid version though, has to be the Magic Resize feature. Let’s say you design a super testimonial meme using a Facebook post template, you probably want to share it on Insta, Pinterest and Twitter too right? Not a problem! With just one click Canva recreates your image in the perfect dimensions for each social media platform. All you need to do is refine the design to make sure it looks perfect and voila! Graphics to fit every platform in minutes. It’s ace! So what do you think? 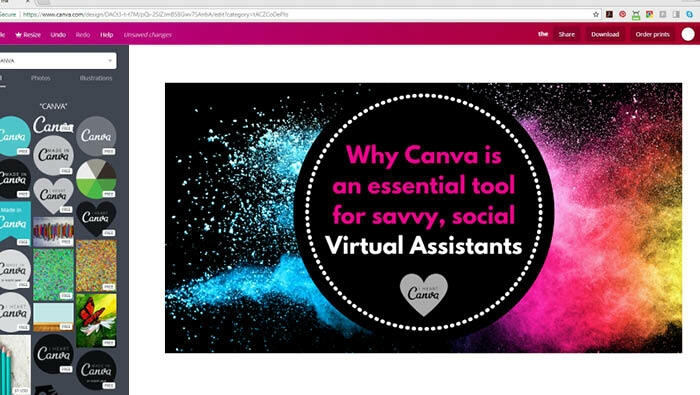 Is Canva an essential tool for Virtual Assistants? I think so and if you’d like to get to know it better with me why not take a wee glance at my online course Create in Canva with Confidence. Whether you’re totally new to design or simply want to uncover more insider tips, tricks and hacks, Create in Canva is a great place to really dig into all the amazing features this online design tool offers and find out how to use it better, smarter and faster. Check out the details for my Create in Canva with Confidence Masterclass here.